The Omnio starter set N° 30: Doorbell is a preconfigured set for switching electrical loads. It can be installed without further configuration. 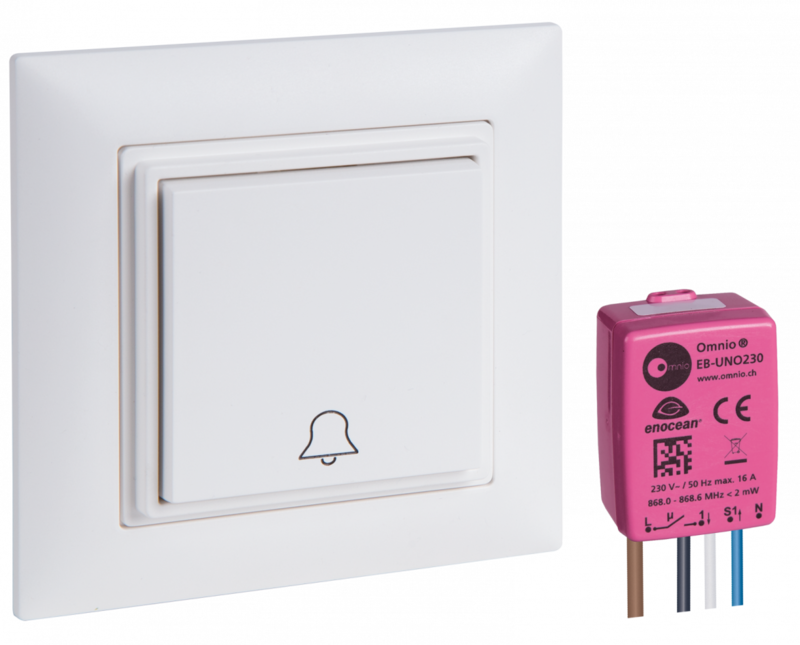 The set consists of a switching actuator EB-UNO and a wall mounted transmitter WS-CH, which is already programmed with the function S04 On-impulse. Its non-isolated 230 V~ output is able to be controlled by up to 49 Omnio radio transmitters. Each transmitter can be programmed with the function S04 On-impulse. Via ARCO the repeater can be activated as well. The extension input is preconfigured by default with the function S04 On-impulse. Bidirectional communication, EEP D2-01-00, ARCO ready (AWAG Remote Commissioning). Suitable as built-in unit.